Our kraft shopping bags are glossy paper which make them a little more elegant looking than the plastic which tend to tear easily. 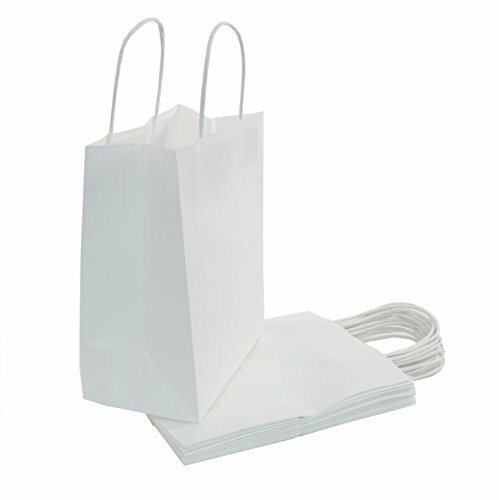 The retail paper bags are perfect size and work beautifully for your business. At this price, they are nice to be able to place product in such an elegant handy bag for your customers. On the other hand, you could print your own labels/logo stamp and put them on each bag, made the shopping bags on behalf of your store. Besides, they are perfect for decorating. You could dress the brown bags up by using ribbon, markers, glitter and pompoms. It it a great way to let the children bring out their creative side that letting them sit color and draw on these bags. Different color will perfect for Easter, Christmas, Thanksgiving, baby shower, any patriotic holiday or birthday and etc. It is a really fun experience and created a lot of cute memories! Bags Material: 110g basis weight. Made of 40% PCW Recycle Paper with a serrated top edge. Brown color of paper shopping bags: It is versatile for just about anything, including gift wrapping, hand lettering and rubber stamping. ECO-FRIENDLY PAPER BAGS. BagDream kraft paper bags are BIO-DEGRADABLE and RECYCLABLE. No peculiar smell and look a lot classier than giving customers those white plastic t-shirt style ones as gifts bags. These brown gift bags are made of 100% PCW Recycled Paper. FSC COMPLIANT. 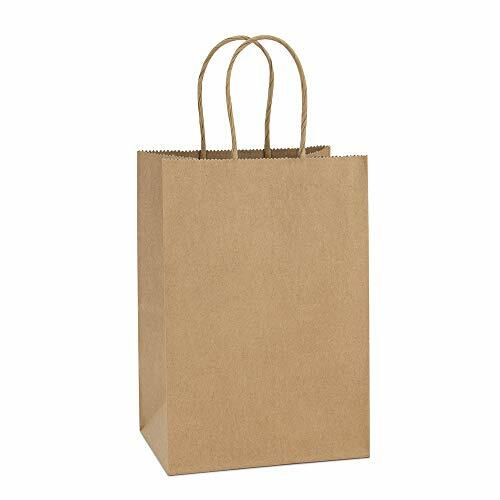 PREMIUM KRAFT PAPER BAGS. Holding up to 6lbs, these sturdy kraft gift bags are made of 110g basis weight paper and have well constructed paper twist handles. No stray glue any where like other paper bags do and the flat solid bottom can make it stand easily. GREAT PAPER GIFT BAGS DIY IDEAS. The brown kraft bags are blank, you could decorate them with drawing, coloring and etc for different holidays as gifts bags to your special ones. Also, as retail carry bags, you could staple your business card or stamp the outside of the bag with your logo on. MULTIPURPOSE PAPER BAGS. 8x4.75x10.5. These plain brown bags are a wonderful medium size for any number of things. BagDream craft paper bags are great for holiday gift bags, shopping bags, retail bags, mechandise bags and wedding welcome bags. 100% SATISFACTION GUARANTEED. We never want to make our valued customers disappointed. If ther's any reasons you're not completely satisfied with our products, just email us and we'll help and fix it up asap (Refund or Replacement). Plus please keep the paper bags to avoid the hassle of shipping them back. Suitable for wedding favor, jewelry packaging, gift wrapping, party, Christmas gift, chocolates, candies, festivals, etc. 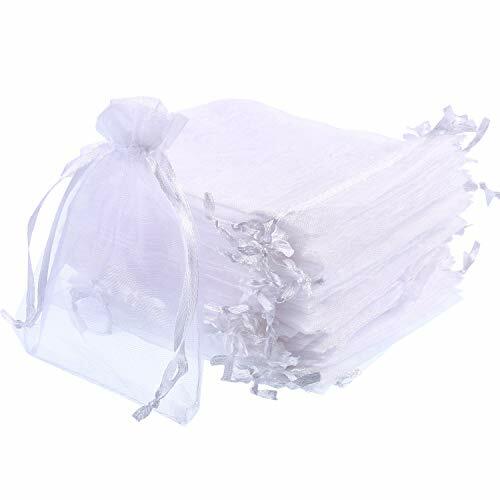 50 White sheer organza bags good for gifting, jewelry pouch, favors, packaging items, etc. That's a pretty pouch bags for you to make your gift own style. With a satin drawstring ribbon to match the elegant sheer colored organza bag, convenient and beautiful for your various demands. You can put many small things in the bags to tighten the sealing and loose the sealing as you want take the things out. Size:approx. 4-1/2 x 3-1/2 inch / 11.5LX9Wcm Package included: 100pcs Organza present bag Warm Tip: Dear buyer, Due to lighting effect,monitor's brightness,manual measurement and etc, there could be some slight differences in the color and size between the photo and the actual item. sincerely hope that you can understand.Thank you . 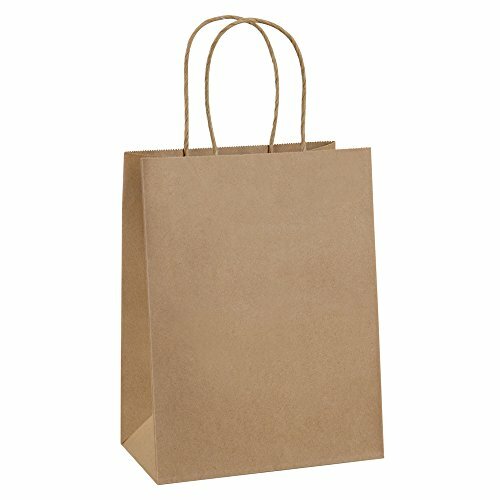 PREMIUM KRAFT PAPER BAGS. Holding up to 6lbs, these sturdy gift bags are made of 110g basis weight kraft paper and have well constructed paper twist handles. No stray glue any where like other paper bags do and the flat solid bottom can make it stand easily. MULTIPURPOSE PAPER BAGS. 8x4.75x10.5. These plain brown bags with handles are a wonderful medium size for any number of things. BagDream craft paper bags are great for holiday gift bags, shopping bags, retail bags, mechandise bags and wedding welcome bags. 100% SATISFACTION GUARANTEED. We never want to make our valued customers disappointed. If ther's any reasons you're not completely satisfied with our paper bags, just email us and we'll help and fix it up asap (Refund or Replacement). Plus please keep the paper bags to avoid the hassle of shipping them back. ENDLESS POSSIBILITIES - enjoy versatility with these white paper kraft bags! They're the perfect solution for a fun way to be creative with gift giving, retail checkout, shopping, or bagging items for a conference. Whether you're headed to(or hosting) a wedding, a boys or girls birthday party, or delivering girl scout cookies, this is a top quality bag at bulk pricing - for a set of 100 to use for virtually anything you can think of. CUSTOMIZEABLE - Since the white paper kraft bag is uncoated paper, it's simple for you to add your own creative touch. Use ink stamps, cutouts, watercolors, drawings, stickers, or anything else you can dream up. This is also a big hit at a child's birthday party - the kids LOVE it when they get to decorate and customize their own bag! PROTECT YOUR GIFT(OR GOODIES) - We give you a bag that's sturdy, - and made with heavy weight paper to reduce the risk of tearing. The handles are carefully fastened, too. 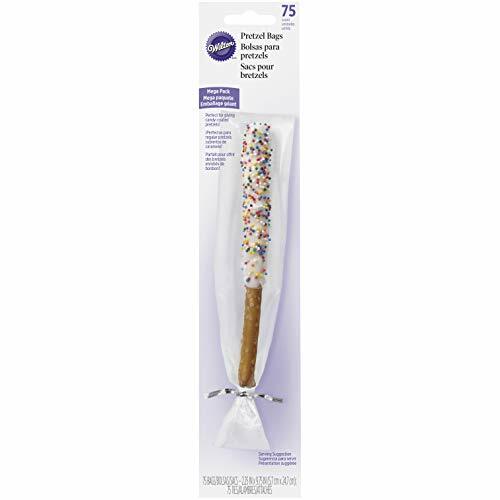 We use heavy duty glue with durable twisted paper handles. EASY LOADING - Each bag has a rectangular bottom, and easily stands up on it's own. This makes your job easier - since putting gifts, party favors, or groceries into a self standing bag makes your life easier(believe me, we've tried doing it the other way with collapsing bags). YOU'RE GUARANTEED TO LOVE IT - If for any reason, you aren't happy with our White Paper Bags, just send them back to us for a prompt and full refund. We want to help you create an amazing, fun experience with these bags quickly and efficiently. If you don't feel like we have done that, let us know. So Order Now, knowing that your purchase is protected with our Money Back Guarantee. Versatile solid brown Kraft paper bags can be dressed up or down. You can leave them plain, stamp them, or embellish them with stickers or charms. Use for greeting cards or merchandise, candy buffets, or bundle them up with twine to package gifts. Our ice bags are made with food grade plastic so it is very safe for use in home, restaurant, schools and any other food establishments. Product is made with virgin resin and EVA is added to make it Durable & Puncture resistant.our ice bags don't get brittle on temperature as low as -20 F. Our bags come with Cotton drawstring for easy handling and closure. SAFE - Our Plastic Bags Meet FDA & USDA Requirement for Food Contact. It is completely safe to use our product at your Home and Kitchen. 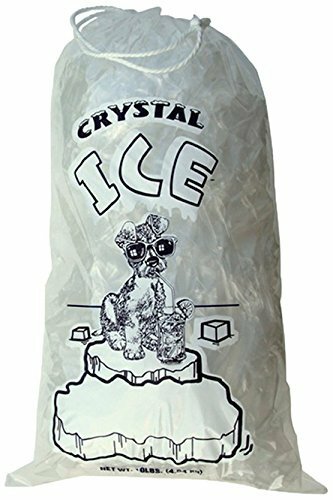 SUPER STRONG - Our Bags are 1.5 mil Thick and are Rated to carry at least 10 lb of ice. EVA has been added to increase the strength and puncture resistance. We can Guarantee that there will be no ripping & tearing while carrying and no more bursted ice bag while breaking ice on floor. FREEZER SAFE - Our Bags are Capable of Handling Temperature as low as -20 F. Special Formulation in production guarantees reducing cracking & brittleness at low temperature. EASY CLOSURE - 100% Pure Cotton Drawstring Helps in easy closure and transportation. There is no need to look for twist ties. MONEY SAVER - Buy More Save More. Buying these 100 pack of ice bags in bulk gives you freedom from running into stores to buy ice and the great thing is each bag cost you less than 20 cents! !Why pay stores Dollars when you can pack your own ice for cents. ? 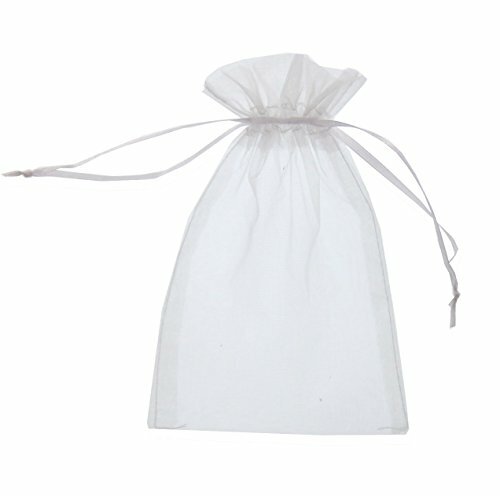 Organza Gift Bags, with Drawstring, Mixed Color Size: about 10cm wide, 15cm long. Organza bags with ribbons are small and exquisite. It can be used for storing your jewelries or other little things. You can also put some gifts in it and present it to your friends. Its economy and beauty are the important reasons for customer to choose. Size: about 10cm wide, 15cm long; Quantity: about 200 pcs. Easily to Use: with drawstring closure which are easy to open and close with drawstring. Could be used for storing your jewelry or other little things.You can also put some gifts in it and present it to your friends. Perfect for jewelry storage and lavender flowers, craft soaps, candy, small gifts, little gift bags, ideal for use in party wedding favors show favor baby shower organza bags. 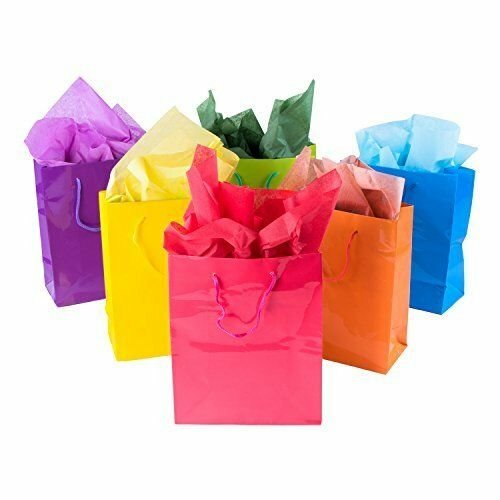 Assorted Color Gift Bags with Glossy Finish and Rope Cord Handle. Available in Multiple Sizes.An All Occasion Gift Bag, Perfect for Parties! Assorted Neon Colors In Every Pack. Package Includes 12 Gift Bags. MULTIPURPOSE PAPER BAGS. 8x4.75x10.5. These plain brown bags are a wonderful medium size for any number of things. BagDream craft paper bags are great for Christmas holiday gift bags, shopping bags, retail bags, mechandise bags and wedding welcome bags. The retail paper bags are perfect size and work beautifully for your small business,tucking in a bunch of little goodies, a dozen or two of cookies, Christmas breads, candles and etc. At this price, they are nice to be able to place product in such a nice little handy bag for your customers. On the other hand, you could print your own labels/logo stamp and put them on each bag, made the shopping bags on behalf of your store. Bags Material: Pure material. Made of kraft paper that is 110g basis weight with a serrated top edge. NICE LITTLE GIFT BAGS. 5.25x3.75x8". 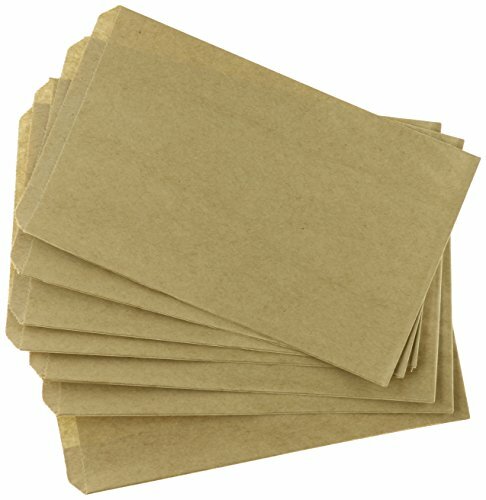 These small brown paper bags are made of 100% Recycled Paper. FSC compliant. STUDIER 110G KRAFT PAPER. Holding 3LBS WEIGHT and products well, our paper bags are perfectly glued but much cheaper than purchasing at your local store. The bottoms seemed solid and the paper twist handles are substantial. ECO-FRIENDLY BROWN BAGS. BagDream kraft paper bags are bio-degradable and recyclable. They have a rustic, upscale and healthier look than plastic. PERSONALIZED YOUR BAGS. These are decent paper bags, with a nice blank matte finish to either decorate or embellish as you require. The blank gift bags can be customized for any occasion. VERSATILE. 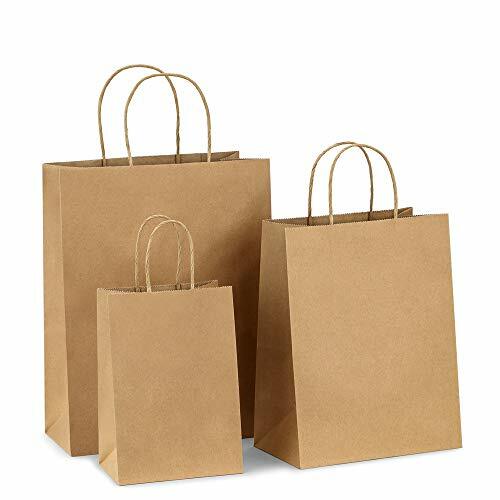 These simple yet elegant kraft paper bags would be great for gift warpping, customized gift bags, shopping bag, goodie bags,favor bags for a wedding or parties. Also nice for retail bags and merchandise bags in local craft shows, art festivals and craft markets, especially during the holidays. Fill these bags full of party favors, giveaways and goodies to create unforgettable handouts for any event from job fairs to National Nurses Week. 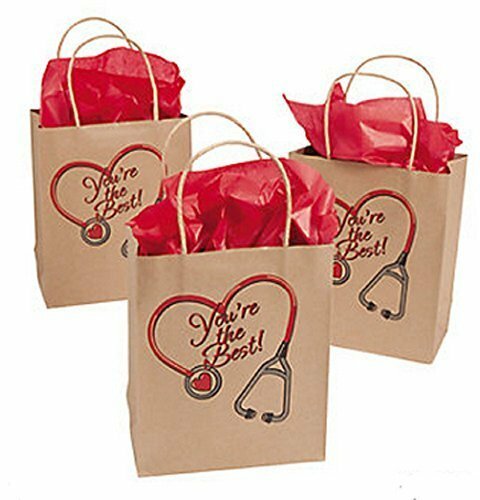 Whether you're a patient or on the same medical staff, these kraft bags are a wonderful way to help you recognize the nurses who help make your life better. 7 1/2 x 3 1/2 x 9 with 4 jute handles. Each bag comes with a drawstring for making the bags easy to close or open. Great for favors, watches, chains, merchandising, bracelets, weddings, stones, gifts, crafts, jewelry, parties,sachets,and so on. Perfect for using when you are traveling. These pouches are easy to use but elegant at the same time. This huge gift bag is excellent for wishing your friends and family well as they celebrate engagements, bridal showers, wedding showers, and more. With a classic metallic design, gift bag works equally well for wrapping oversized birthday or holiday presents. Even the largest gifts can be wrapped easily in this attractive package. The Hallmark brand is widely recognized as the very best for greeting cards, gift wrap, and more. For more than 100 years, Hallmark has been helping its customers make everyday moments more beautiful and celebrations more joyful. 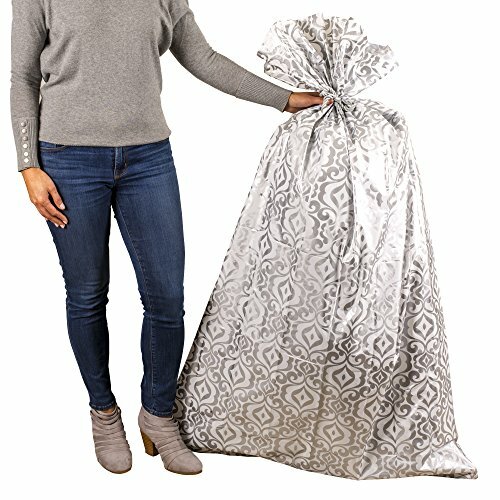 Wrap even the biggest gifts quickly and easily with this extra large gift bag. Jumbo gift bag measures 36 x 56 and is perfect for wrapping oversized presents like kitchen appliances, pillows, bedding sets, and more. With a classic metallic scrollwork design, gift bag is elegant enough for special occasions like weddings, bridal showers, and anniversaries. Gift bag set includes one large plastic bag and a silver cord to tie the present closed. DIY Plain White Paper Bags for Retail and Shopping Halulu brings you plain brown paper bags that are great DIY and craft bags. Since they are not printed so you can personalize them with your own message or design. They are great gift and favor bags for parties, marriages, baby showers, birthdays, anniversaries, festivals, etc. The thick paper bags can be painted, stamped, inked, printed and embellished in any way you please. They make a good creative activity for kids who can decorate the bags with flowers, paper cut-outs, buttons, sequins, ribbons, etc. Free standing Bags for easy Loading The bags are designed like a tall box with a flat bottom that is gusseted for strength. They can stand free and are very easy to load. The wide top opening allows you to put even large items such as a salad bowl in it. Strong bottom and tightly sealed sides make it a very strong and sturdy bag. The thick kraft paper that is used to make the bags is very strong and can take at least 5.5 lbs of weight. Biodegradable and Green Bags Buy these bags with the knowledge that they will not harm the planet in anyway. These bags are completely biodegradable, can be composted, recycled and reused. The storage paper bags are great for storing clothes, shoes, books, papers, cosmetics and a whole load of other things. 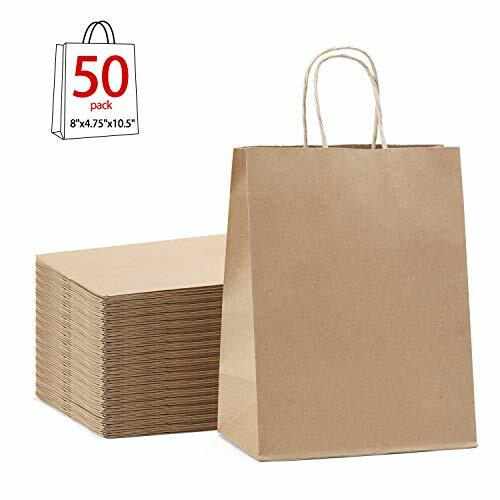 Each pack contains 50 premium brown Kraft paper bags. Buy your supply of bags now for same day shipping. Multipurpose Paper Bags: Size: 8" x 4.75" x 10.5", Halulu craft paper bags should be your first choice. These plain brown paper bags can be used for a variety of purposes. Use them to store clothes or shoes, or to organize your wardrobe, or even as shopping and gift bags. Strong and Versatile Bags: These bags are made with thick plain brown Kraft paper and have a strong rope handle. They are strong and sturdy paper bags that can carry at least 5.5lbs of weight easily. The box type bags have a flat bottom so they can stand well. Durable DIY Paper Gift Bags: These bags are perfect for craft and DIY. They are plain brown and can be painted, printed and embellished as you may wish. Personalize the bags to make them uniquely yours. Print your own business logo and use them as retail carry bags. Sturdy Handles: Halulu Kraft paper bags have handles that are attached well to the bags. They do not come off like handles on other bags. All the seals on the bag are very strong and do not open up or rip apart easily. Large opening allows for keeping large items. Eco-friendly Bags: Halulu bags are made with an eco-friendly biodegradable material. These bags can be recycled, reused and composted. Halulu bags come with our 100% satisfaction guarantee. If you are not happy with the product, return it for an exchange or a refund. Get your pack of 50 bags now! Besides, they are perfect for decorating. You could dress the orange bags up by using ribbon, markers, glitter and pompoms. It it a great way to let the children bring out their creative side that letting them sit color and draw on these bags. Different color will perfect for Easter, Christmas, Thanksgiving, baby shower, any patriotic holiday or birthday and etc. It is a really fun experience and created a lot of cute memories! Bags Material: 110g basis weight. Made of 100% PCW Recycle Paper with a serrated top edge. Tojwi organza bags is high qualtiy, perfectly for storage stuffs and widely used in our life. BEAUTIFUL-sheer organza and satin drawstring closures, very beautiful and elegant. FUNCTIONAL-greats for holding small size gifts, stones, favor,watches, earrings, bracelets,candies, cosmetics sample,great for party/wedding/store/chruch use. ATTENTION: Due to the camera of image exposure,shadows,bright value and contrast,the color of the item may be a little different from the picture. MATERIAL:Made of high quality sheer organza and satin drawstring,beautiful decoration, cute pouches, make your gift look cute, upscale and attractive. SAFETY STORAGE: Design with a satin drawstring for closure, the objects will not fall out, perfect for storage little things, you can find items easily from the clear tulle pouches. 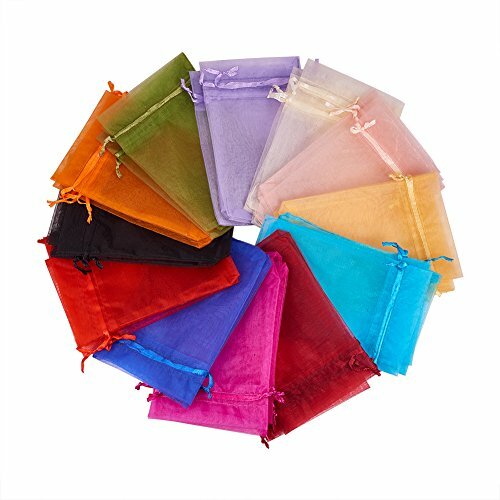 SPECFICATIONS:drawstring bags mixed random color;Size-3.54''x4.33''(9x11cm);Package include 50pcs organza bags. MULTI-USE:Great for pack candies,jewelry,crafts,sachets,watches,favor gifts,stones,cosmetics sample,stationery etc. And solve your trouble of pack little stuffs while travelling. OCCASION:Great for Party, Wedding, Company, Church, Hotels,Stores to wrap favor gift. Pack presents of anniversaries, festival, Valentine's Day and kinds of promotion gifts. These little self-zipping bags are ideal for protecting, sorting and selling seed beads, earrings, and other small items, Clear plastic, and quantity: each lot consists of 500 bags, whose storage capacity measures 3 x 4 inch (doesn't include area 'outside' of seal). Use RANGE, product packaging, small parts, jewelry, grains, dried fruit, cosmetics, frozen products and so on. The poly zip bags are made of polyethylene material, food grade safe; Dual-side thickness and durable enough to protect your item. These high-quality Resealable Zipper Poly Bags allow you to have the bags you use most on hand. The Resealable Zipper Poly Bags seals open all the way to the edges of the bags giving you full use of the interior. Made from the material for FDA & USDA approved applications. 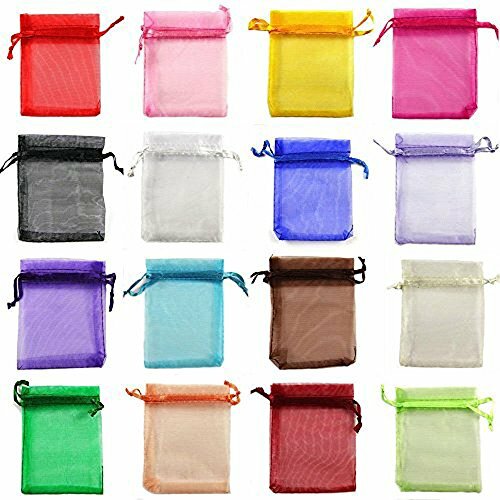 Beautiful and lasting impression by adding this premium quality Ziplock Bags to your favor bags, Apply to Kitchen Storage, Jewellery Packaging, Office Stationery Storage Bag etc. Buy with Confidence! 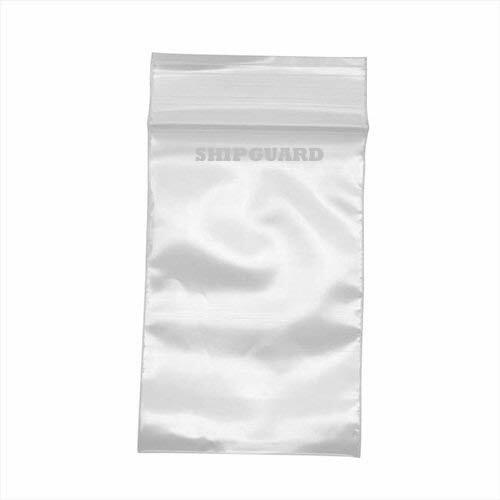 Present to you by ShipGuard Resealable Zipper Poly Bags: Hassle free return, no question asked. This Resealable Zipper Poly Bags is designed and created by FDA & USDA approved applications and is exclusively sold by ShipGuard. Client Service: The ShipGuard zipper poly bag is straightforward that you have any inquiry about our items, it would be ideal if you don't hesitate to get in touch with us. Products to arrive free of damage or defects. Great client administration will be advertised. Product Specification: Brand Name: ShipGuard Color: Clear Quantity: 500 Bags Style/Shape: Poly Bag Size: 3 4 WARNING - Do not hold hot items or liquid. Do not microwave. For the sake of safety, please keep the bags out of the reach of kids under the age of 3 to prevent accidental swallows.